CBS fall 2012 lineup: Jonny Lee Miller, Michael Chiklis, Janet Montgomery. CBS shocker: A drama I might actually watch! 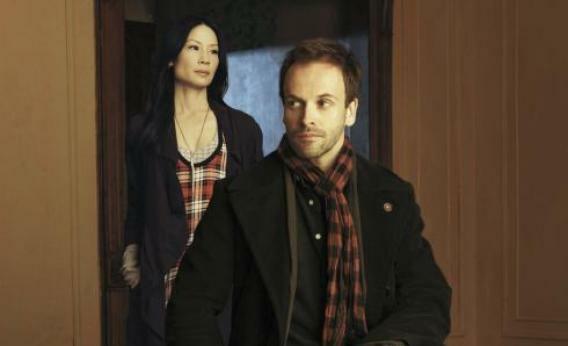 Jonny Lee Miller and Lucy Liu in Elementary. As a matter of critical consensus, CBS’s The Good Wife is the best drama on network television, but this particular television critic tends to find himself doing something else when it’s on, whenever that is. In fact, he has not regularly tuned into a CBS show for pleasure since, like, Murphy Brown, and thus approaches the CBS upfront with an academic attitude that enables him to marvel academically at the juggernaut of the Tiffany Network. When Nina Tassler, the network’s president of entertainment, touted her line-up as “television’s best schedule,” there was little to say other than yes, and wow, and Sam Malone is on CSI these days? Nice gig. So that was one pleasure of Wednesday’s Carnegie Hall presentation. Another was the gentle shock of seeing clips of a CBS drama I might actually watch for fun. That would be the detective drama Elementary, which earns its bad title for being inspired by Arthur Conan Doyle’s tales about the man in the deerstalker. Why the network felt a need to declare this debt is beyond me. Maybe the real hounds of Baskerville County will show up at some point. But what we have for now is a procedural about a deductive genius from London (Jonny Lee Miller) who is in recovery from an addiction (to the seven-per-cent solution?). His “sober companion” (Lucy Liu) assists him in solving crimes perpetrated in the city of New York. This is maybe just House without a hospital. CBS threw its afterparty under a tent at Lincoln Center. The stars of new and returning shows smiled behind velvet ropes, where they chatted with their producers and their publicists and had their photos taken with admirers. Thus do upfronts parties offer indices of shows’ relative popularity. We see whom the American public—as represented by media buyers and media buyers’ accountants’ assistants and the general manager of the Buffalo affiliate—most wants to take a bad iPhone photo with. On the evidence, the ladies really do love Cool James and medium-cool Chris of NCIS: Los Angeles, and also Person of Interest’s Jim Caviezel, who is bigger than Jesus in his way. CBS’s other new dramas are Made in Jersey and Vegas. Think of the former as Legally Blonde with a brunette, or Working Girl without the Staten Island Ferry. It tepidly imagines that a Garden State homegirl is sassing up a white-shoe law firm. The lead, Janet Montgomery, is extremely appealing. Beneath the tents, passing fashion editors expressed to me keen interest in featuring Montgomery in lay-outs. In turn, I expressed an interest in following her career, starting one or two shows after this likely turkey. Vegas is set in Nevada, the state to which CBS turns when it wants to mix things up a little. Witness The Defenders. Witness Dr. Vegas. Witness the “musical-dramedy” Viva Laughlin only if you’re feeling especially masochistic. Starring Dennis Quaid and Michael Chiklis, set in the early 1960s, and sadly bereft of the dollar sign that graced Aaron Spelling’s Vega$, the show somewhat suggests Boardwalk Empire done as a Western. At the party, Chiklis proved the more eager of the stars to glad-hand. It took Quaid a while longer to be submit to the ritual. He was busy eating sushi and shooting the bull with Nora Ephron, the wife of Vegas’s co-writer, Nicholas Pileggi. Not gonna blame him.